I have recently read David Parker's review of The Early Text of the New Testament (eds. Hill and Kruger; OUP, 2012) with great interest, since I have contributed to that volume with an essay. The review has just published in the current Journal of Theological Studies, Vol. 64/2 (October) 2013, pp. 642-45. However, I became suprised with the generally negative critique, although Parker concludes with the reservation that, "These shortcomings in the conception of the volume should not deter anyone from reading and benefiting from individual contributions to which it has given rise." the pre-fourth-century period of the transmission of the NT materials, some MSS in Section II are dated after 300 and Section III lack reference to third-century writers, in particular Origen." I think Parker is correct about a lack of focus, which probably reflects the freedom given to each author. As the editors point out in the introduction, "the editors have not asked the individual authors . . . to endorse one approach or method over another" (p. 18). Further, Parker is entirely correct in his latter observation – there is an omission in terms of patristic authors. However, I do not understand the problem with including manuscripts (papyri) dated after 300, first because the dates themselves are seldom exact. Let me take an example from my own chapter where I write in a footnote concerning the dating of P110: "The first editor W.E.H. Cockle dates P110 to the 4th cent. 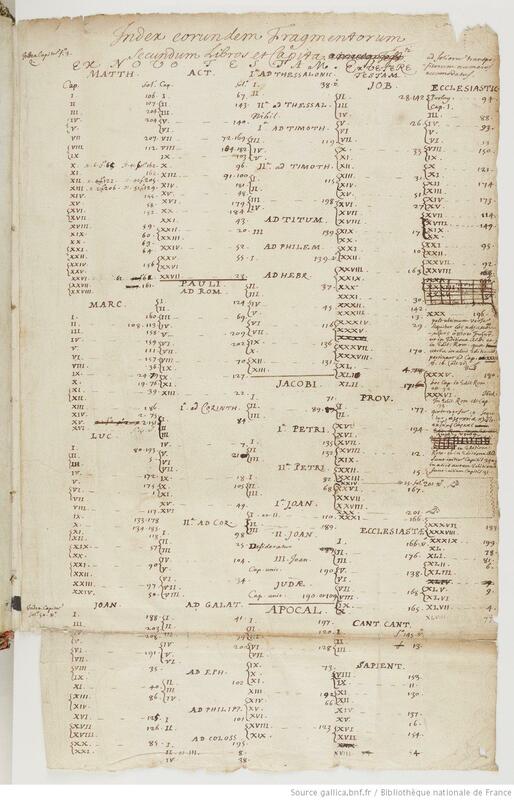 but at the same time notes the similarity of script to P45 (3rd cent.) and P. Flor. 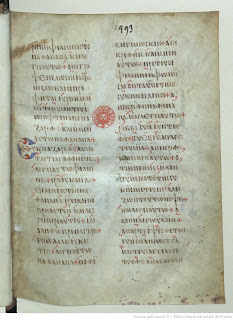 II 108 (ante c. 260). The evidence points to the first half of the 4th century" (p. 87, table 5.1, note j). Further, I am certain that Parker is aware of the importance of tracing textual trajectories between the early papyri and later MSS. 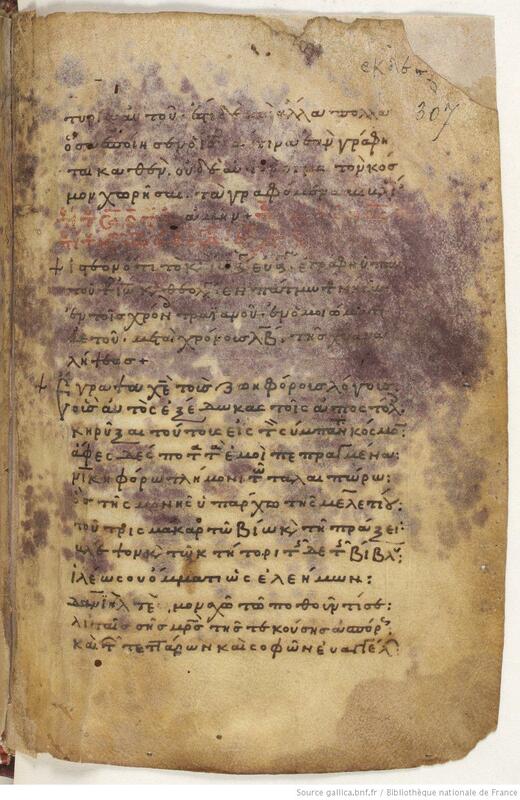 For example, it would be a serious omission to speak about the early text of Luke and John (chs. 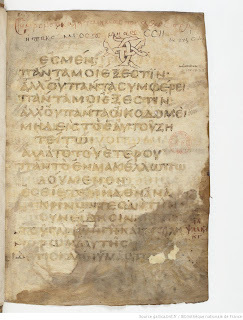 7-8), while not mentioning Codex Vaticanus (B 03) because of its date after 300. The book does not address methodology for comparing and analysing the witnesses, beyond adopting the terminology of the Aland handbook as updated in its second edition and by Barbara Aland in an article of 2002 (manuscripts are listed under the categories of ‘Strict’, ‘At Least Normal’, ‘Normal’, ‘Free’, and ‘like D’ on p. 11). Parker then proposes that Hill and Kruger have confused this method with the Coherence Based Genealogical Method (CBGM) – "a serious misunderstanding" – when they refer to it as the "Münster approach" to classify early manuscripts "in three major groups" (although the editors are well aware of the CBGM to which they refer on p. 8 n. 38). To this I would reply that one thing does not have to exclude the other. The Alands' approach to analyzing early, in particular small, papyri and categorize them as "strict," "normal," or "free" should not be seen as a relic from the past now made redundant by the CBGM. 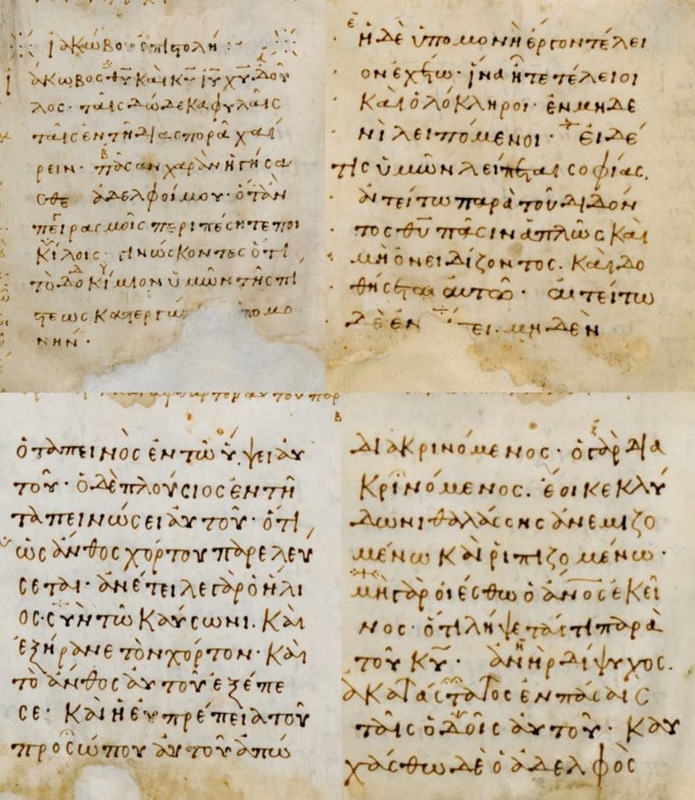 In fact, Barbara Aland's last doctoral student, K. S. Min used the method to analyze over a dozen papyri in his excellent dissertation on the earliest transmission of the Gospel of Matthew, published in 2005 in the ANTF series (a series now edited by Parker). By that time the CBGM had been applied for many years. Arguably, this method of analysis, as described by Barbara Aland in the Festschrift for Delobel, New Testament Textual Criticism and Exegesis (Leuven, 2002), pp. 1-13, and elsewhere, can justifiably also be labeled a "Münster approach" (although I would personally avoid it). Badly fragmented witnesses certainly present a very special risk. The genealogical relationship between a fragmentary witness and another witness is determined on the basis of its limited text supply. As the distribution of prior and posterior variants in a text can be very different it is possible that an entirely different picture would have resulted from the complete witness, if it had been preserved. The pre-genealogical and genealogical data used rests upon the entire corpus of the Catholic Letters (not upon single writings). When agreements with a given witness are checked or potential ancestors are searched for, smaller fragments are excluded. Smaller fragments are those which share less than 50% of the variant places in the given witness. Hence, when Eldon J. Epp in his important essay "Textual Clusters: Their Past and Future," in The Text of the New Testament in Contemporary Research (eds. 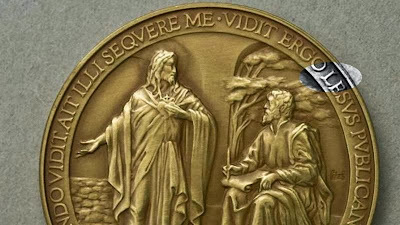 B. Ehrman and M.W. Holmes; NTTSD 42; Leiden: Brill, 2013), 564, asks what is the appropriate method for identifying the D-cluster ("Western" text), he questions the usefulness of the CBGM, since it does not take into account fragments (the D-cluster contains the fragmentary P38 and P48). Yet, this classification system, with its considerable relativity, is not without value, for it reflects the general scribal process. 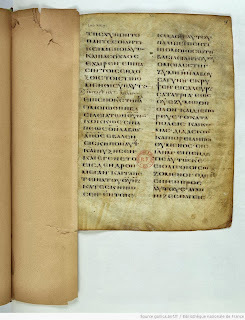 For example, the close textual relationship between P75 and Codex B . . . does show a 'strict' connection with their respective exemplars–and with others along that line of transmission. I find it really remarkable, and a serious flaw, that none of the contributors to Section II seems to pay attention to, or in some cases even to be aware of, the Text und Textwert series (I except the chapter on the catholic epistles). These volumes make it possible to compare a witness with any other witness in a systematic manner, and to take an important step towards an overview of the textual history of a work. They are far more valuable, since they provide hard facts, than the Aland categories. The first volumes were published in 1987. How can what purport to be articles dealing with contemporary scholarship ignore them? I have several objections to this harsh criticism, especially if it is applied to my own essay, "The Early Text of Matthew" (pp. 83-107). First of all, in my introduction, I explicitly point out that "numbers and percentages are more important than corresponding labels like "free," "normal," and "strict" and that "the validity of the results ultimately depends on the size of the sample and the specific nature and pattern of textual variation–variants should be weighed as well as counted" (p. 84). In my opinion, I use a proper method providing facts as hard as they can be in this business. More importantly, I do not see how I could have used Text und Textwert in order to analyze most of these small papyri. 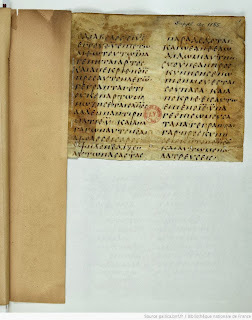 When I wrote my chapter, I of course had to relate it to Min's recent and extensive examination of the Matthean papyri, and I felt that I could improve on some aspects, and in a few cases I came to slightly different conclusions regarding the classifications. But then I basically had to use the same method on the material. In Min's case, Barbara Aland, director of the very institute that produced the Text und Textwert series, apparently did not see the need to use that tool either, because Min never refers to it in his monograph, as far as I can tell. Instead, as I have pointed out, Min uses the method of analysis which Aland continued to develop and describe (long after the development of the CBGM and the Textwerttool). 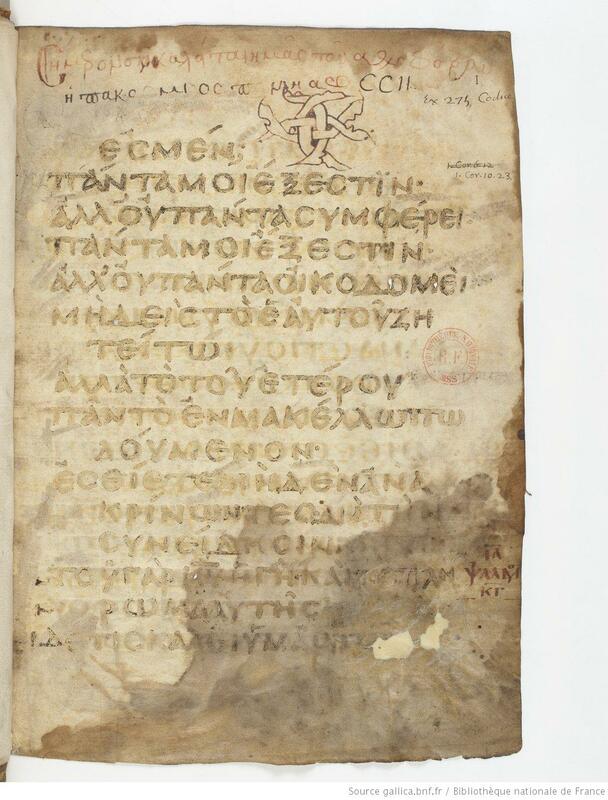 If we turn to one of the most significant examinations of NT papyri, that of James R. Royse in his magnus opus, Scribal Habits in Early Greek New Testament Papyri (NTTSD 36; Leiden: Brill, 2008), he does not use the Text und Textwert tool either, as he analyses six of our most significant and extensive papyri. 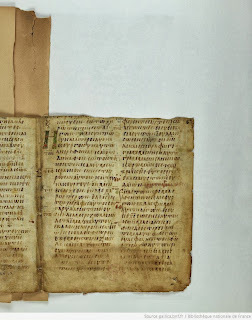 On the contrary, he is entirely occupied by examining how well the scribe copied the exemplar. In his introductory chapter on methodology, we may further note that he gives a rather positive evaluation of Barbara Aland's method of analysis (pp.60ff), although he chooses to analyze the singular readings only (which is particularly useful when dealing with larger papyri). 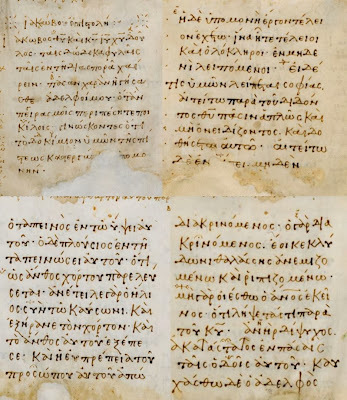 In Parker's recent essay, “Understanding How Manuscripts are Related” in Textual Scholarship and the Making of the New Testament. 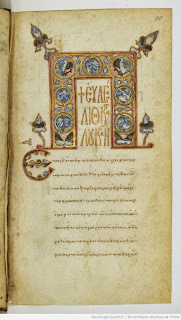 The Lyell Lectures, Oxford, Trinity Term 2011 (Oxford: Oxford University Press, 2012), 65-100, in which he describes ways of understanding relationships between MSS, he does not explicitly mention the Text und Textwert tool (although the index claims so), albeit there is a brief reference to "comparison of textual data in test passages in the Gospels." Instead, he rightly focuses on the CBGM, referred to as the "Münster Method." Apparently, Parker concentrates on the method he thinks is most useful to apply to the material in order to solve the research question. In my own essay in the volume under review, I have tried to do the same thing. 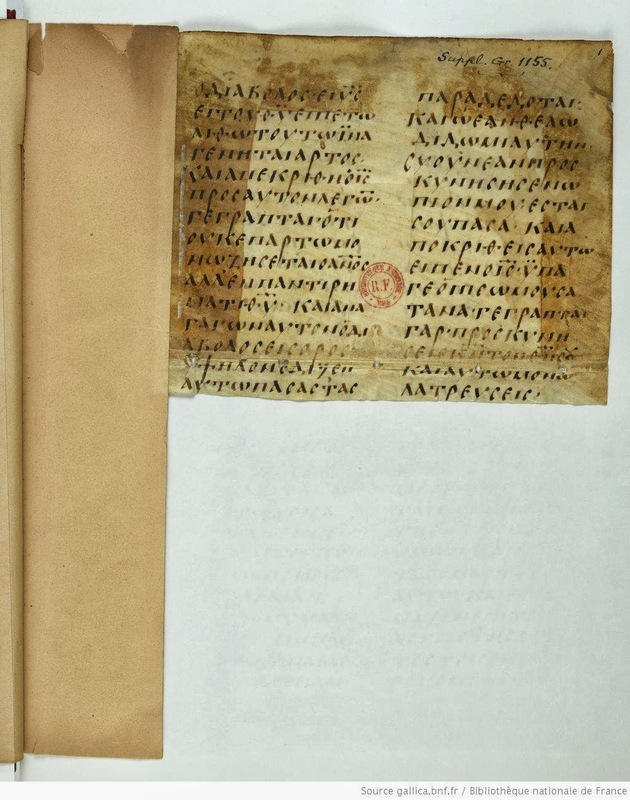 I did not mention (nor used) the Text und Textwert tool because I preferred to use a different "Münster method" which I find more suitable for analyzing early (and mostly fragmentary) papyri. I sum, I think Parker is correct when he identifies a general lack of focus in the volume under review; this is because the individual authors were given great freedom in terms of method and approach. Further, Parker has rightly identified the omission of references to third-century writers (e.g., Origen), but I object to the other points of criticism. When is a Manuscript a Minuscule? 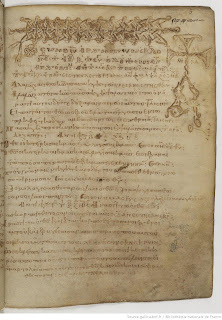 Here is one of those enigmatic treasures that can be found among the later manuscripts, Biblioteca Medicea Laurenziana, Pluteo VIII.14. 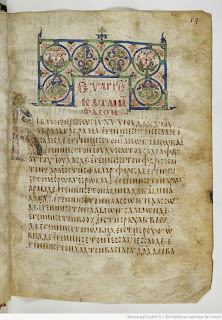 It is a composite manuscript that in its current shape contains the bulk of the letter of James on the first 18.5 folios, an unidentified text on the verso of folio 19, Chrysostom's sermons on Matthew from folio 21, and finally Victor of Antioch on Mark (the last two items as per Pinakes). 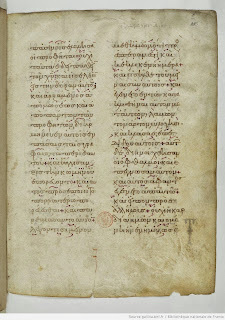 The text of James is laid out as a typical commentary manuscript with the main text occupying a relatively small block halfway down near the inner margin and the commentary written around it. 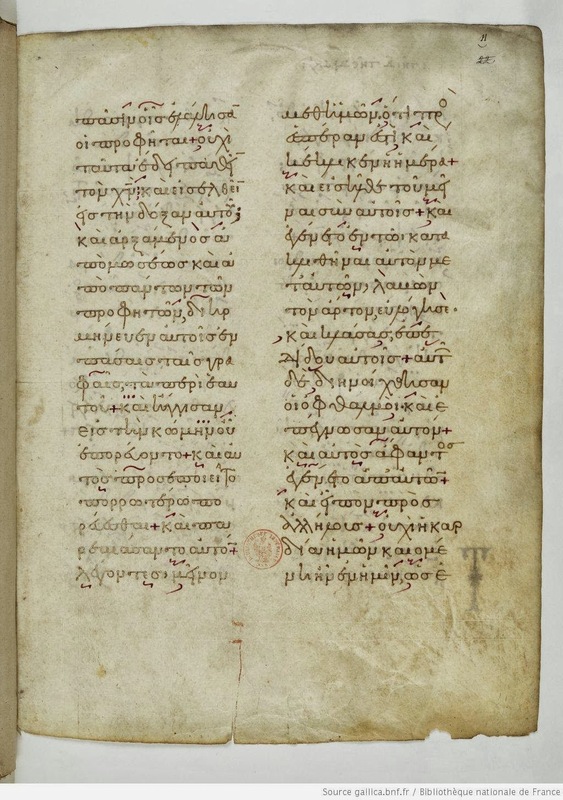 However, though on the last two pages the main text is laid out as normal, the commentary has not been added, and it seems that the commentary breaks off at the recto of folio 18. 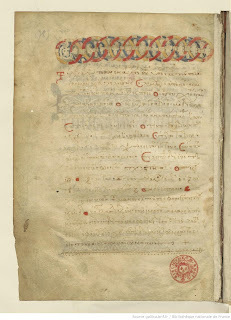 The final page with text of James looks like this and brakes off at James 4:15 αντι του λε-. What strikes me though, is that this item is listed as a minuscule. Admittedly there are a number of ligatures, and the commentary is in a minuscule script, but the main text with all its individual letters looks to me rather majuscule-like. 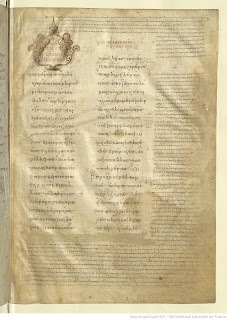 There are other examples where the text is in majuscule and the commentary is in minuscule, like X(033), or where part of the work is in minuscule and the remainder in majuscule (without either being a supplement), such as in minuscule 566 and Λ(039), which was divided up by Tischendorf. 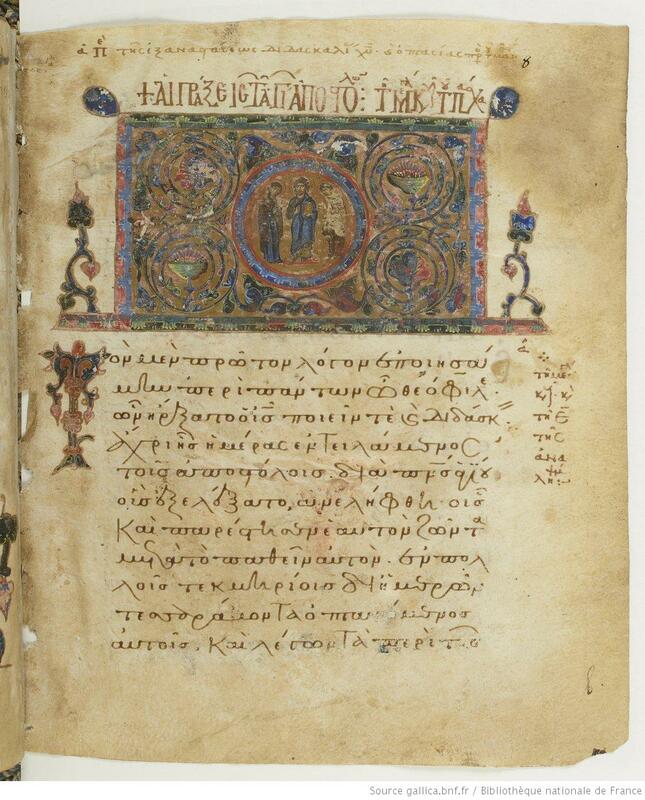 Here is a composite image of the main text of the first four pages. Our annual blog dinner will take place on Sunday night, 24 November following the Textual Criticism / Digital Humanities joint session. We have a reservation at the Hard Rock Café in the "Beatles' Library". As always, the event is open to anyone interested in New or Old Testament textual criticism. We have the option to a special $26 group menu deal which is inclusive of an entree, desert, drinks, gratuity and taxes. Please RSVP in the comments, indicating (1) that you would like to attend and (2) that you would (or would not) like the group menu. From what I saw at other restaurants, this is a great deal. Whilst working on my paper for the upcoming SBL in Baltimore (abstract here), I wrote a section which I cannot use in the paper, but would love to get some comments on. It is not about the Coherence Based Genealogical Method (CBGM) as such, but about a potential misconception of its most fancy result, the Global Stemma. "Once we have produced a global stemma there may be an unintended side-effect for the unaware reader, which, in an ironic twist, repeats the error we have tried to avoid by doing away with the notion of text-types. 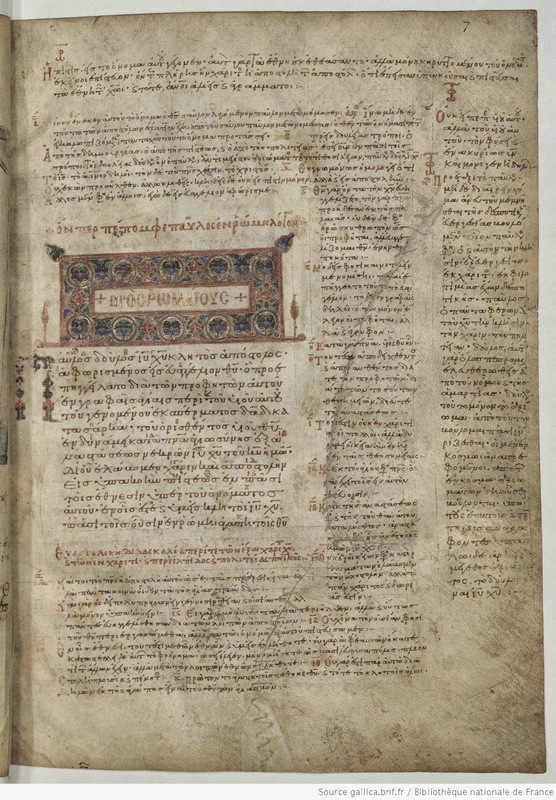 A problem in the use of text-types is that the voice of a whole group of manuscripts is reduced to a single voice, even when it is clear that, in the current state of play, there is no evidence that the whole text-type goes back to a single ancestor. 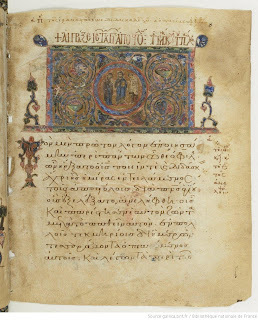 To reduce manuscripts to simply being members of, say, the early Alexandrian type is simplifying a complex reality to the level of becoming only a near-truth. However, with a global stemma a similar abuse of the constructed genealogy is possible. 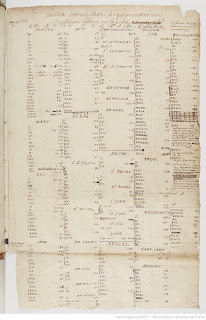 The error is this, that manuscripts that are not on the top layer but on the second, third or lower level, are seen as being dependent on the manuscript(s) above them and therefore can be discounted (as per Westcott-Hort). But of course, in the CBGM this is not the case, since the rationale behind the global stemma is that it only gives the closest 'potential ancestor' but not all 'potential ancestors'. 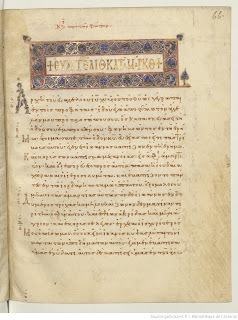 I assume that many of the manuscripts on the higher levels still need the Ausgangstext (initial text) as one of their potential ancestors to explain all their variants and are therefore still independent witnesses to that initial text. Yet the danger of reduction is real: instead of falsely reducing individual witnesses to being mere members of a text-type, witnesses could be reduced to having little or no independent value because they do not have the Ausgangstext as their closest ancestor. The main reason for this apparent misconstrual of the meaning of the global stemma is that the term 'genealogy' is employed in its own singular way — not as indicating the ancestry of the text in the strict meaning of the word, but rather as pointing to a text with a higher proportion of earlier readings. And the difference between these two is huge! The term 'genealogical relationship' as used in, say, the Introduction to the Editio Critica Maior (ECM) suggests much more than it is actually supposed to mean." Two articles and four reviews have been published so far in the current volume of TC: A Journal of Biblical Textual Criticism vol. 18 (2013) – see contents below – and there is more coming soon. As one of the editors of this peer-reviewed journal, I would like to strongly encourage our readers to submit articles for considerations (for instructions see here). If you are preparing a paper related to biblical textual criticism e.g., for the upcoming SBL, do not hesitate to submit an article version to TC – send an e-mail to editors [at] jbtc [dot] org. Abstract: This detailed study of P27 suggests some adjustments to the older editions. 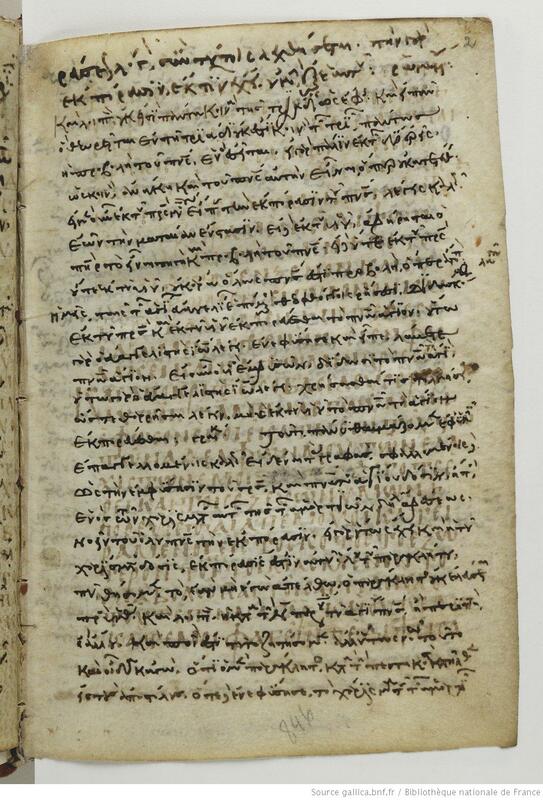 In addition to revisiting its measurements and illegible letters (dots), some readings within the manuscript are challenged. 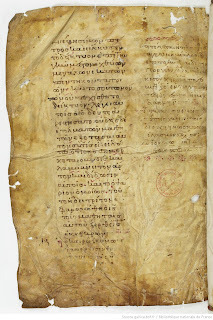 A previously unnoticed alpha can be added after a new investigation into the object features of the fragment (απασα, verso line 19). It is noted that P27 contains some interesting Sonderlesarten often not included in critical editions, e.g. 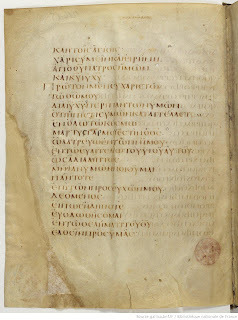 the original aorist passive ε/ηλευθερωθη (verso line 16). The NA27 and NA28 reading of Rom. 8:26 without υπερ ηµων could also be confidently backed up with P27 vid. 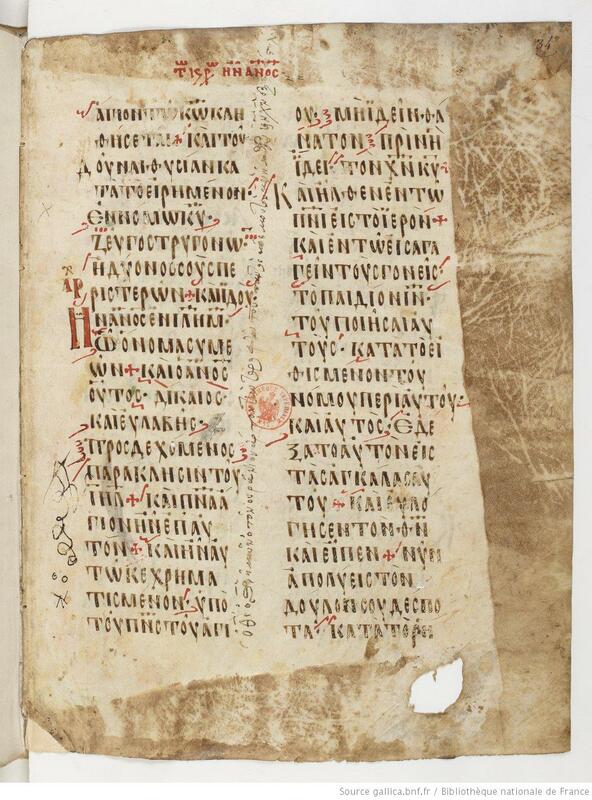 Some speculations are raised concerning the almost illegible reading on verso line 6. 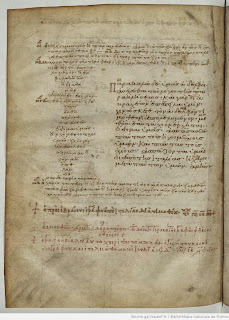 The possibility of the text reading κρα]ζομεν instead of υιοθε]σιας εν is suggested on the basis of an omission of the second ελαβετε from Rom. 8:15 and the three dots above the last two letters of κρα]ζομεν indicating a pause before the word abba. 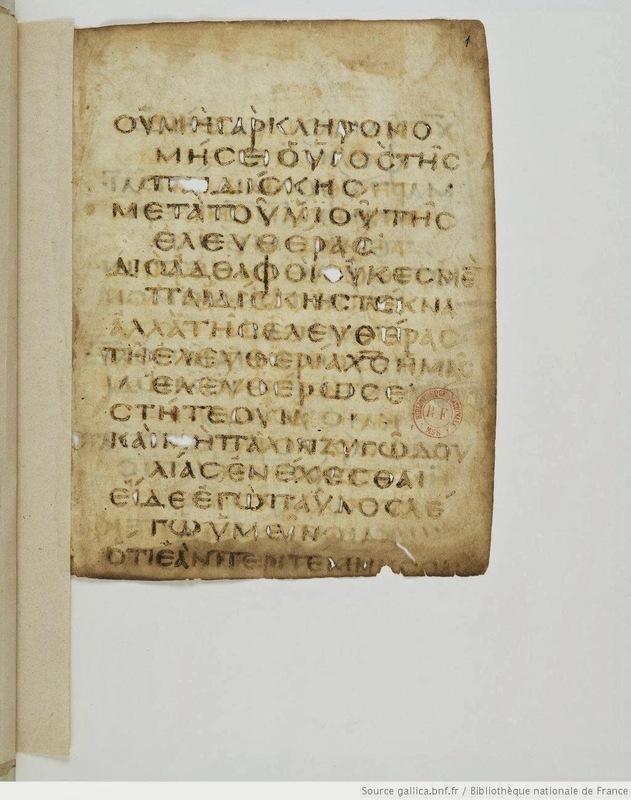 All in all, the study argues that the papyrus was read publically due to the reading aids that it contains. Abstract:This article suggests that certain difficulties in Prov 12:27 stem from a confusion of the gutturals ח and ע, and interpretation of יקר as an adjective rather than a verbal form of the root קרה. Making these minimal emendations, a balanced and coherent text is obtained for the verse. As mentioned previously, the prominent Coptologist and Bible scholar, Karlheinz Schüssler, passed away in a tragic car accident on October 8, 2013. He was an honorary Professor at the University of Salzburg, and an official obituary is now available through their website. 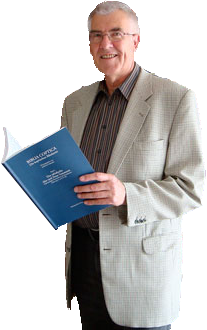 Those involved with the various ECM editions will remember Karlheinz Schüssler for his recent contributions to the Birmingham ECM project. Schüssler, with the assistance of his Doktortochter Christina Kreinecker, started the work on the critical edition of John which is now being completed by Hans Förster (Vienna). Notably, Schüssler’s labor on John never ceased. 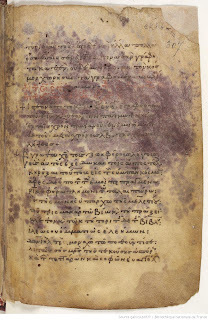 In August, he published the editio princeps of an early Sahidic witness from the Chester Beatty library, which includes extensive discussion of the other continuous manuscripts. 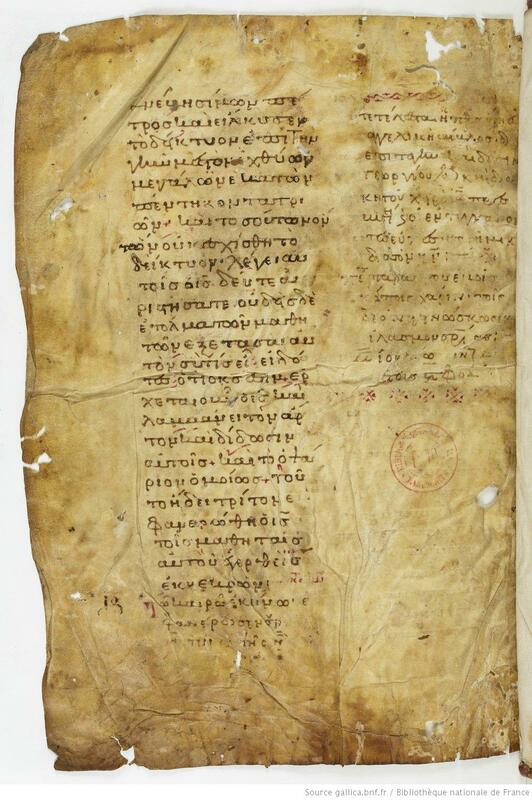 Few scholars appreciate just how young the study of Coptic literature is. In terms of truly modern critical editions, little of the known corpus has been published, the principle problem being the highly fragmentary nature of the majority of the scattered manuscripts. 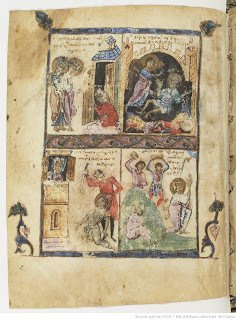 Through his Biblia Coptica fascicles, Schüssler has become widely known for his work in cataloging the known witnesses to the Sahidic Coptic biblical tradition. The series offers copious codicological information, aggressively surveys the background literature and presents photographic examples of scribal hands. The Biblia Coptica catalog system developed contemporaneously with a similar Münster system, and in recent years the relevant scholars have collaborated extensively. 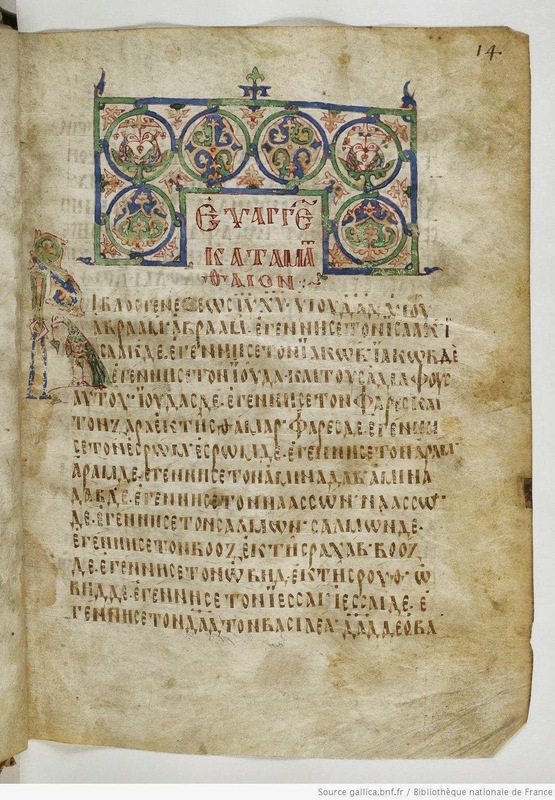 Notably, Schüssler’s first Coptic Bible publication was his 1991 critical edition of the Catholic Epistles, which originally was his Münster PhD dissertation. During the era of Kurt Aland, he was a fellow student of Gerd Mink and Franz-Jürgen Schmitz, working in the INTF. 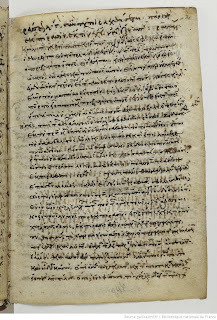 Karlheinz Schüssler was also interested in Sahidic lectionaries, until recently edited the Journal of Coptic Studies, established an institute devoted to Coptology and Egyptology (Salzburg), was the first scholar to apply radiocarbon dating to White Monastery manuscripts and maintained an extensive archive of microfilms and digital images from all the major libraries. I have glossed over his wider knowledge of and participation in Egyptological and Near Eastern studies, of which one may read more in his official obituary (link above). When you do history, the only real discoveries consist of unearthing things that everyone, or some, or at least the discover, did not know about till then. I had this experience when I followed up a note in Hoskier's Text of the Apocalypse. 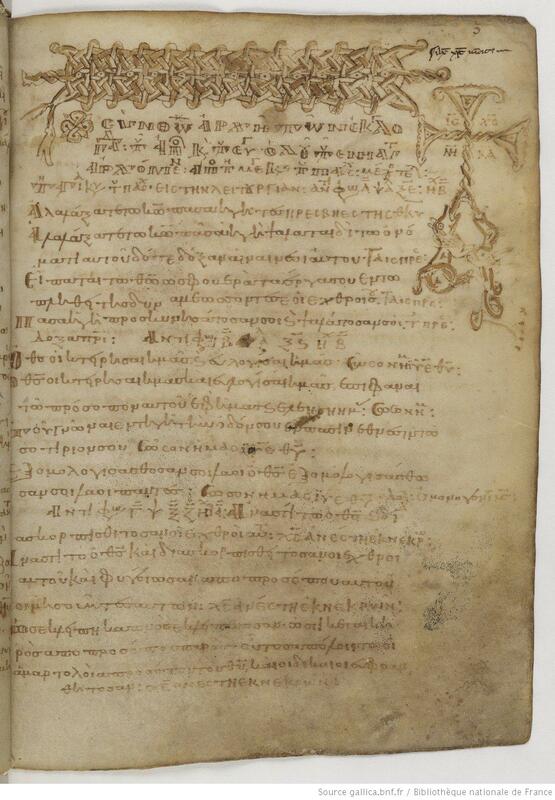 He notes that three manuscripts of Revelation have a curious little drawing (or perhaps better a pictogram) instead of the word 'the sun' 'ο ηλιος'. It is a curious little drawing and I am not sure it looks like a sun, much more like a circle with a tail, perhaps a comet. I have heard from David Parker the sad news that Prof. Karlheinz Schüssler (Salzburg) died in a car crash last Monday. 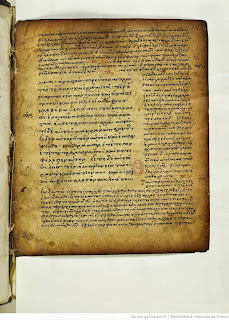 Prof. Schüssler was editor of Biblia Coptica (the effort to register systematically all of the scattered leaves of early Coptic Bible texts) and of the Journal of Coptic Studies. There are too few involved in the area of Coptic Bible, and this is a serious loss to the discipline. 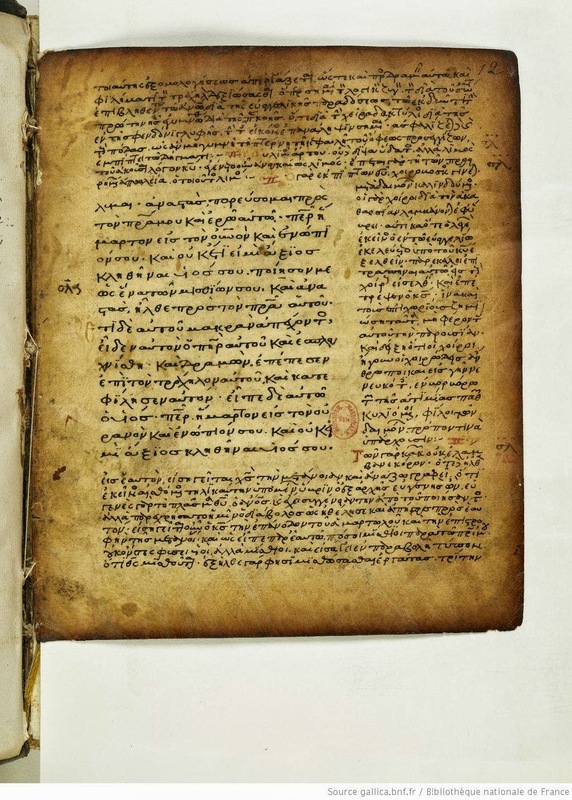 Prof. Schüssler contributed to the International Greek New Testament Project, and hosted the IGNTP magnificently in Salzburg. It was a privilege to get to know him then and he will be sorely missed. Chris Keith, "On the Pericope Adulterae: A Response to J. Keith Elliott" (pp. 432-38 ). Chris Jordan, "The Rediscovery of the Sherborne Lectionary" (pp. 482-97). Søren Holst, Review of Rediscovering the Dead Sea Scrolls: An Assessment of Old and New Approaches and Methods. Edited by Maxine L. Grossman (pp. 633-35). 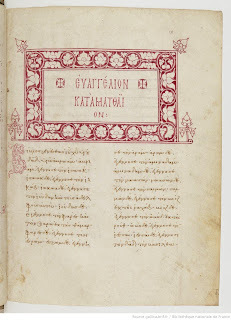 J. K. Elliott, Review of Novum Testamentum Graecum: Editio Critica Maior. Edited by Institut für neutestamentliche Textforschung/The Institute for New Testament Textual Research. Vol. 4: Die katholischen Briefe/Catholic Letters. Edited by Barbara Aland, †Kurt Aland, Gerd Mink, Holger Strutwolf, and Klaus Wachtel (pp. 636-42). David Parker, Review of The Early Texts [sic] of the New Testament. Edited by Charles E. Hill and Michael J. Kruger (pp. 642-45). 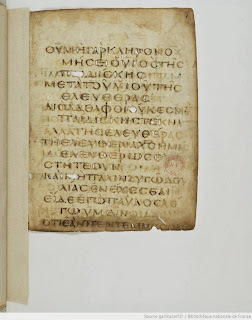 J. Lionel North, Review of The Story of the Bodmer Papyri: From the First Monastery’s Library in Upper Egypt to Geneva and Dublin. By James M. Robinson (pp. 645-46). 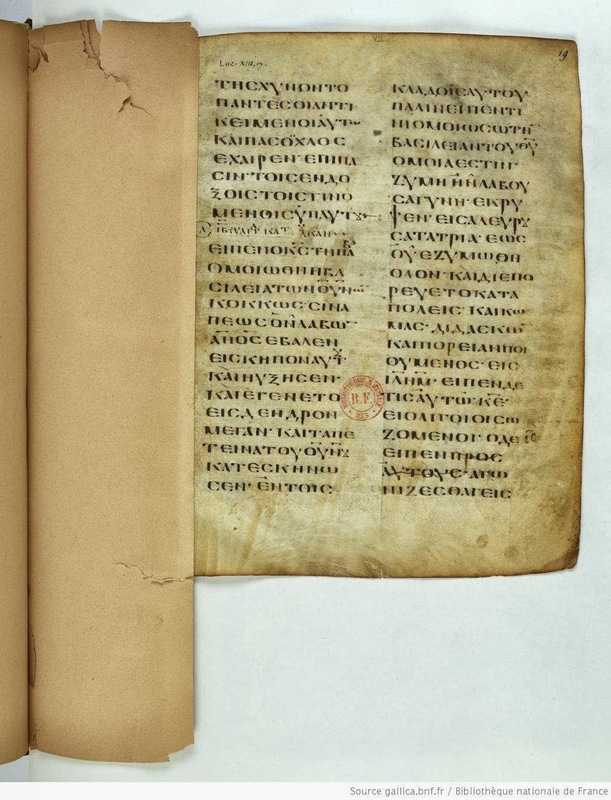 In a subsequent blogpost I will return in more detail to David Parker's review of The Early Text of the New Testament, because it contains some unfair criticism (and, of course, because I am one of the contributors to that volume). Clearly Jesus is spelled as Lesus. According to the source of this story (in Dutch), the medals have been withdrawn. And it has now also made the BBC. On Thursday 8 October, world-renowned Coptologist Rodolphe Kasser passed away. 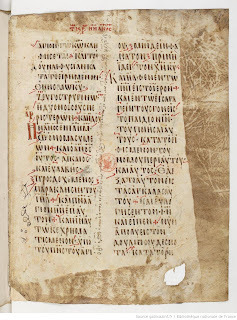 Kasser was involved in the editing and publication of numerous important manuscripts, including Coptic gnostic texts from Nag Hammadi, Bodmer payri (with Biblical texts), and, more recently, the Codex Tchacos, containing the Gospel of Judas and three other Coptic gnostic texts. J’ai le triste devoir de vous annoncer le décès du Professeur Rodolphe Kasser. Coptologue de renom, Rodolphe Kasser s’est signalé notamment par ses travaux sur les Papyrus Bodmer et, à date plus récente, par la publication du célèbre Évangile de Judas. Mme Anna Kasser, Rue Pestalozzi 4bis, 1400 Yverdon-les-Bains, Suisse. I learned something fascinating about the Greek of Revelation that I had not expected, and certainly was never told. What everyone knows is that certain prepositions (such as δια, εις, υπο) take certain cases, with a number of prepositions being able to take two or three different cases, often with a semantic difference between these. The case of the substantive that follows the preposition is determined by the preposition. In the construction 'he who sits on the throne' the case of the prepositional phrase 'on the throne' (ἐπί + article + θρόνος) that follows the participle 'he who sits' is normally identical to the case of the participle. 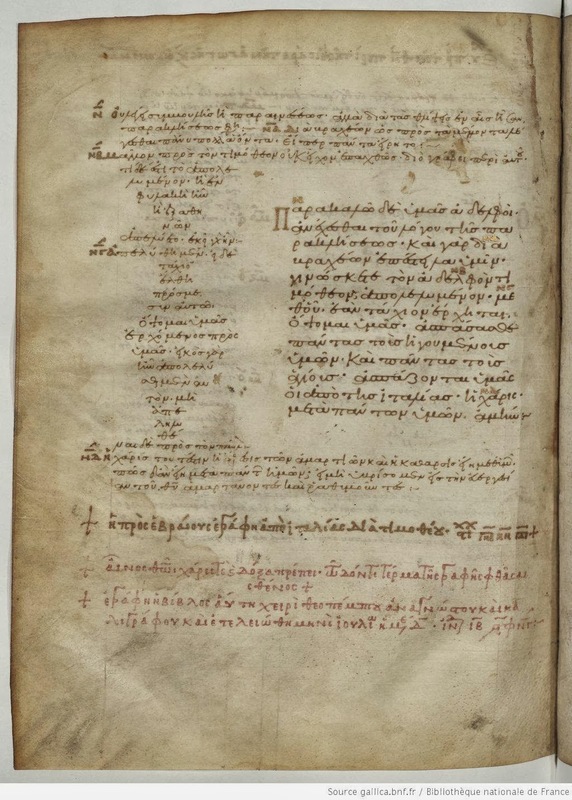 So we have ἐπὶ τοὺς θρόνους ... καθημένους (4:4); τῷ καθημένῳ ἐπὶ τῷ θρόνῳ (4:9); τοῦ καθημένου ἐπὶ τοῦ θρόνου (4:10). There are a number of exceptions. With the nominative (ὁ) καθήμενος we find both ἐπὶ τῷ θρόνῳ (21:5) and ἐπὶ τὸν θρόνον (4:2) and with other combinations of κάθημαι ἐπί (e.g. with αὐτός) it doesn't apply as much. It would be nice if someone could give a good linguistic explanation of this phenomenon. 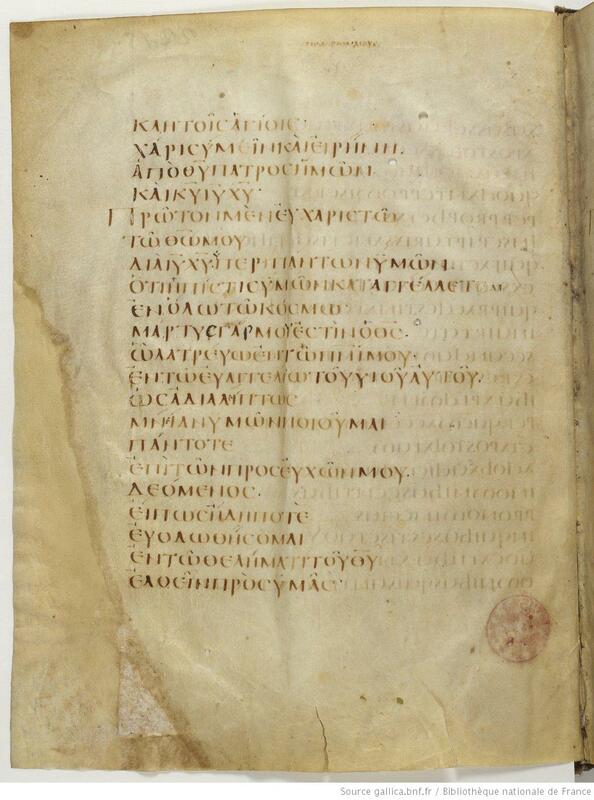 Revelation does not contain the cleanest possible Greek grammar, but it is nice to discover that there is at least some reason behind the confusion. But how to teach this to an undergraduate class I don't know. Emanuel Tov writes on Electronic Tools for the Study of the Hebrew Bible here. Seems that there is a bit of interest in marginalia at the moment. A nice post on the John Rylands Library blog by John Hodgson with helpful images illustrating various cadels, drolleries, grotesques, and such things in mostly medieval manuscripts. Chris Brady picks out some nice photos from M. Camille, Image on the Edge: The Margins of Medieval Art (2004). 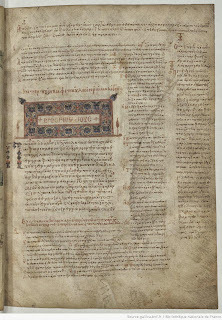 In other news I noticed this interesting discussion of the British Library's conservation of the fourth volume of Codex Alexandrinus (i.e. the NT) prior to digital photography (note the interesting photograph).